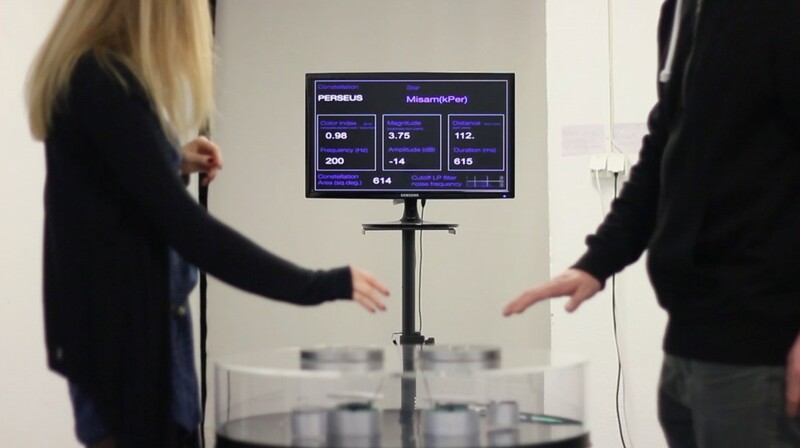 Stellar is an interactive installation and interface for scientific data sonification. 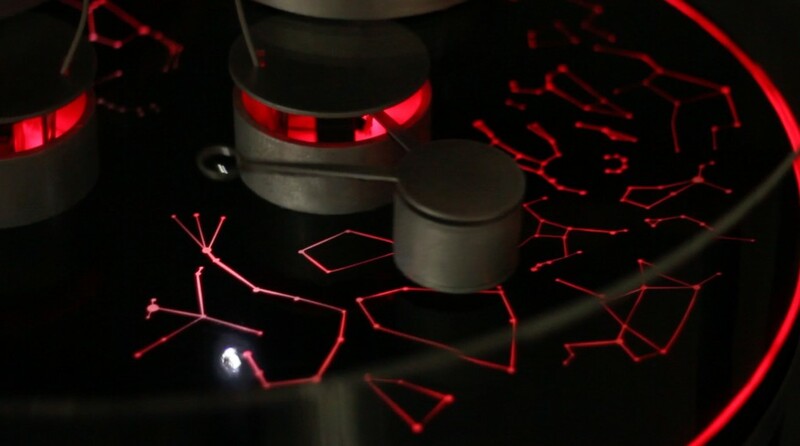 The project aims to create a sonic representation of stars and constellations through a dedicated interface. Since there’s no sound in space, I wanted to conceptualize a link between electromagnetic and sound waves. 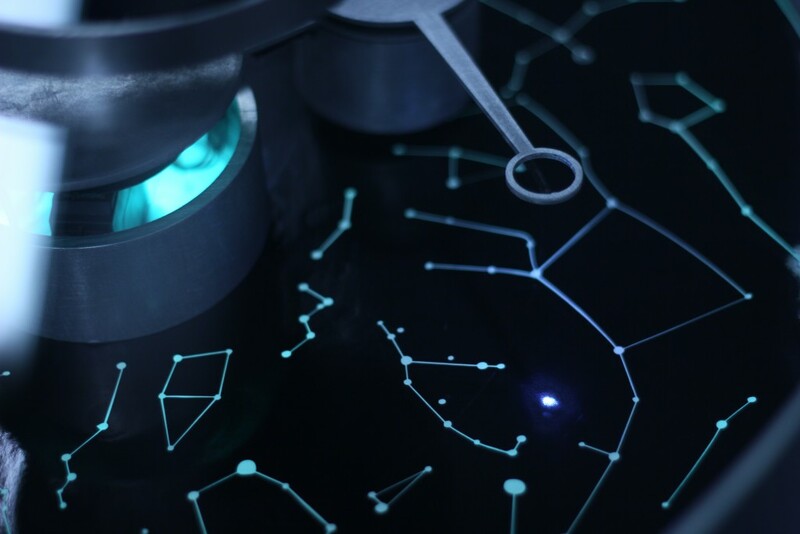 The goal was to create a minimalistic, interactive device which would allow visitors to learn about specific stars through sound information. 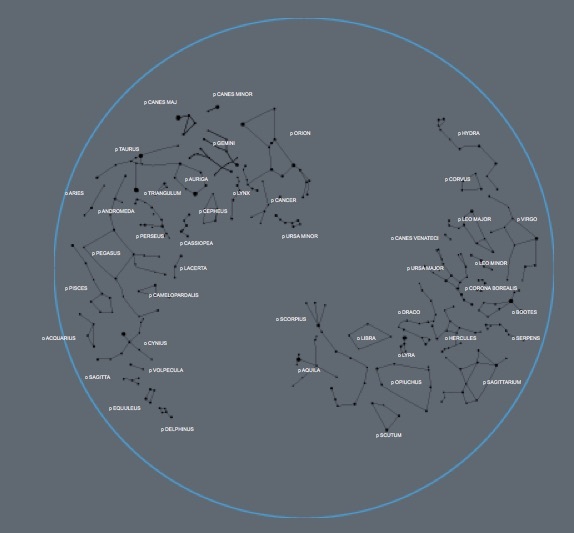 The base of the system is a cylindrical structure, on top of which are displayed the most important constellations of the northern sky. Above this representation are two robotic arms. 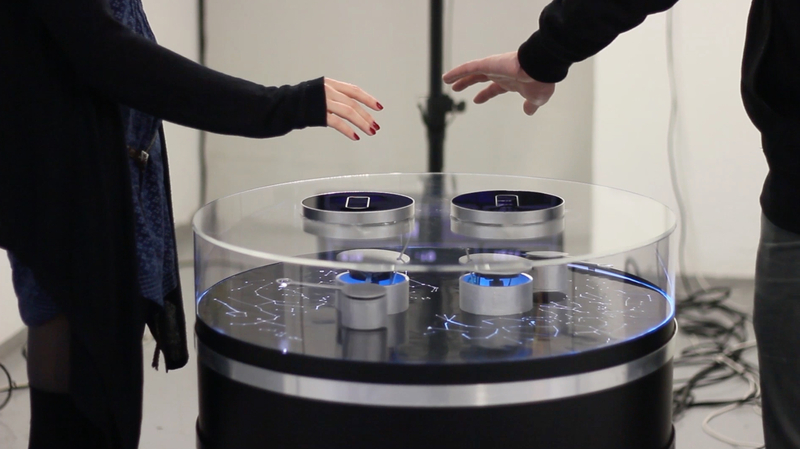 Two players can use the system at the same time, by moving their right hands over the two black, circular sensors. This allows them to move the robotic arms both horizontally and vertically. When the tip of one of the arms aligns with a star, the information obtained from it is translated into sound materials. The same concept is applied to the visual. 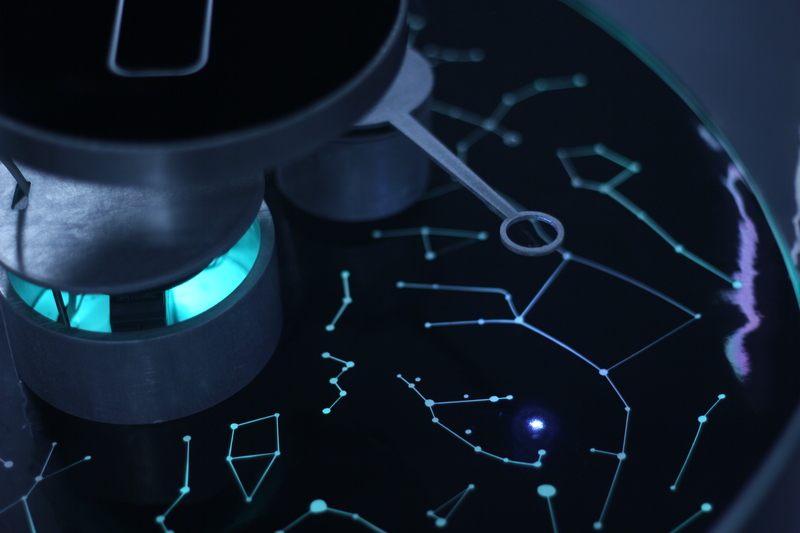 When a star is selected, the circular viewpoint depicting the stars will light the actual color of the star. These colors are also projected on the walls. 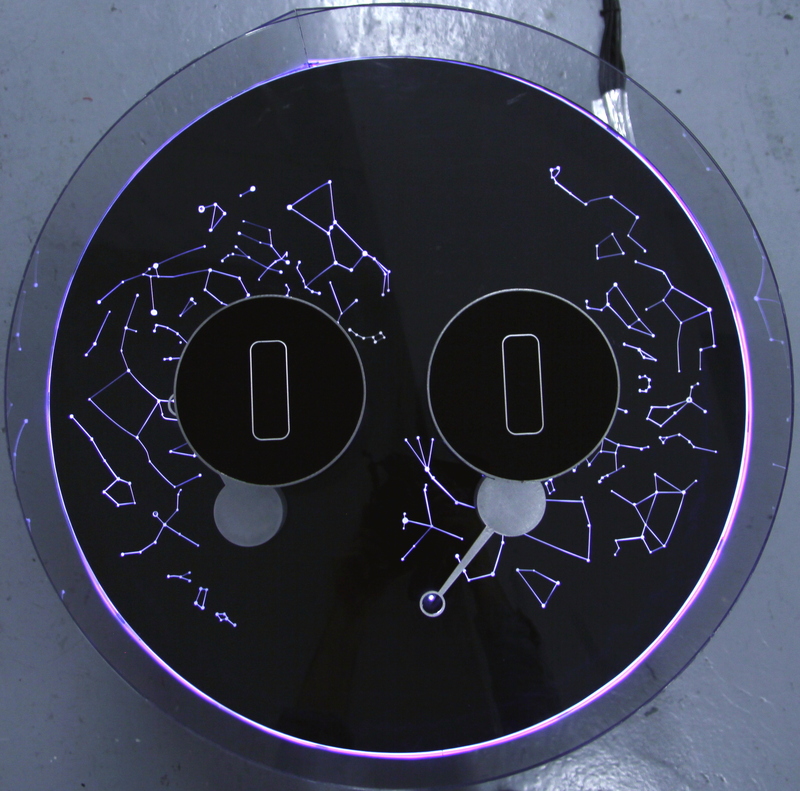 Visitors can see the information about the stars and their sonification in real time through one or two monitors placed next to the structure. 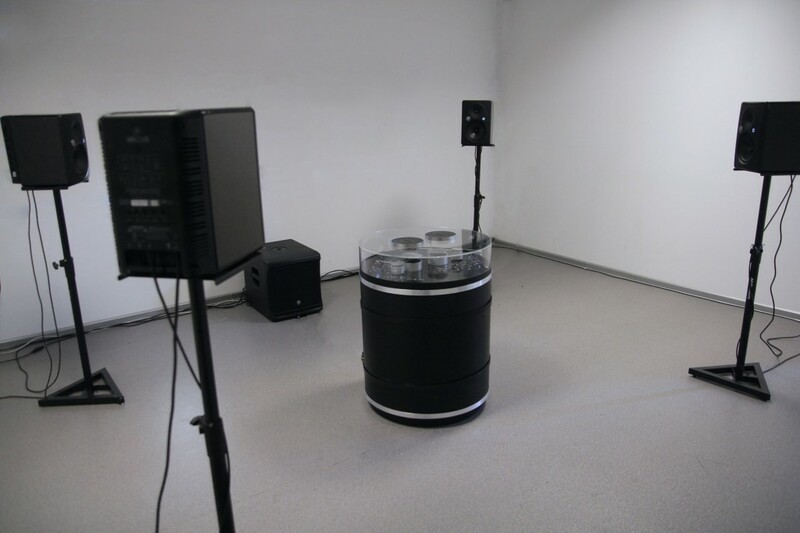 The sound spatialization is provided with a quadraphonic system. 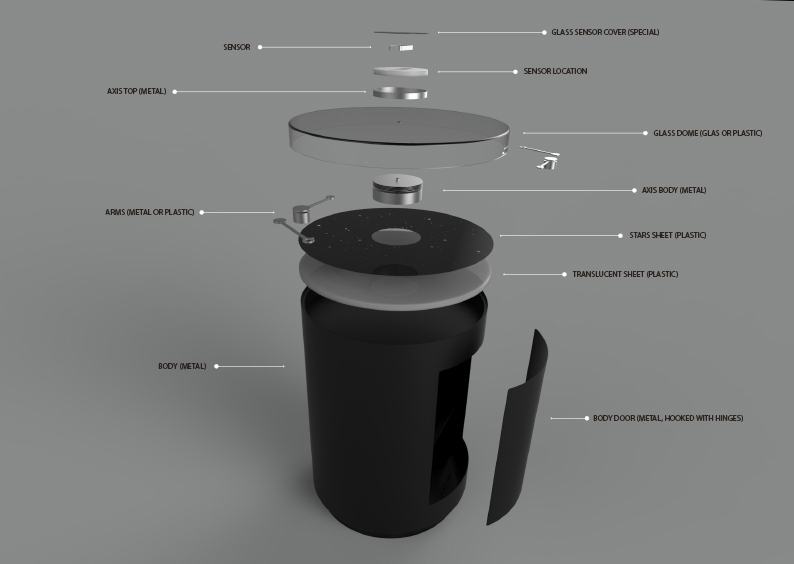 The project has been developed using Arduino and Max7 software. 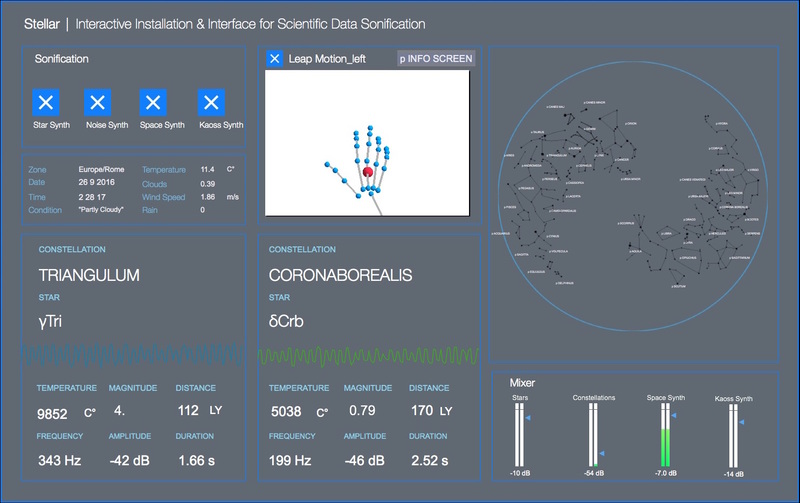 Data of more than 300 stars and 44 constellations have been stored from the open-source software Stellarium.org, and coded to interact with the robotic arms. In the first version of Stellar I opted for a minimal and elementary approach, perhaps at the expense of a more captivating sound performance, but in favour of greater clarity and conceptual coherence. For this reason used only sinusoidal sounds. The sound engines are in fact two simple polyphonic synthesizers. The data detected for each star are: temperature (color index: red star = old and cold, blue star = hot and young), brightness (as seen from Earth), distance (from Earth); respectively transformed into: frequency (Hz), amplitude (dB), duration (ms). The colder the star, the lower the pitch; the brighter it appears to us from Earth, the louder the sound; the further from Earth, the longer the duration. For example, a bright, red star thousands of light years from the Earth would generate a low frequency, loud and long sound. A blue star which is closer to the Earth would generate a high frequency, weaker and shorter sound. The background drone-sound is white noise (which is a combination of all frequencies, the opposite of space-silence). When a constellation is triggered, the number representing its area (squared degrees), becomes the cutoff frequency of a low-pass filter for the noise signal. In this way, larger constellations will gradually increase the noise spectrum. 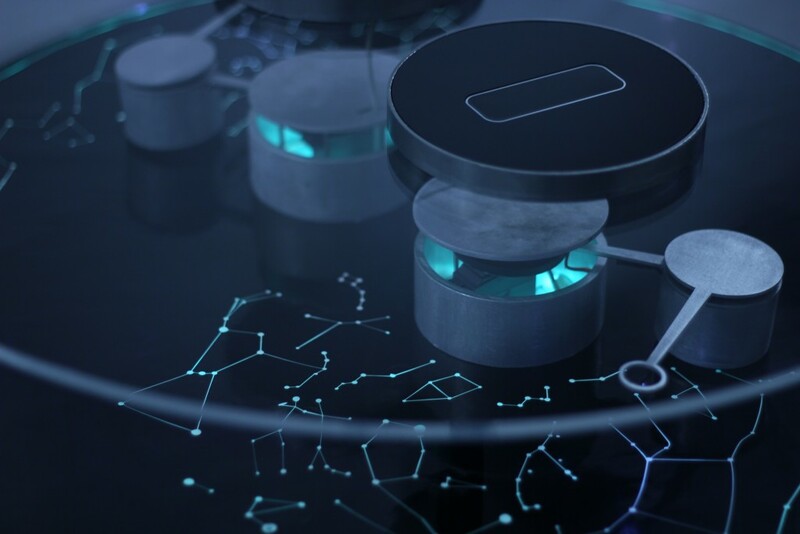 The second version of Stellar includes a wider range of audio and visual solutions. A first addition are two new synthesis engines that allow the creation of more complex sounds, in favour of a more creative use of the interface. 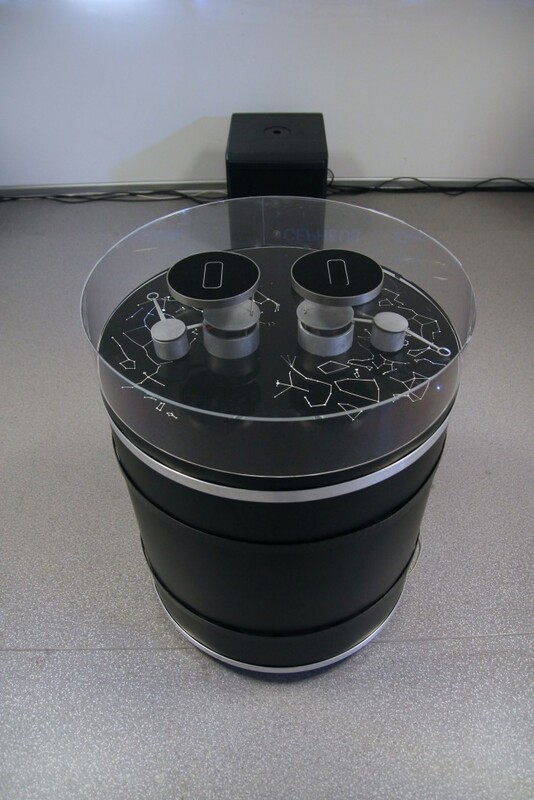 The first new synthesizer is a granulator. The decision to use this type of synthesis is not random, but linked to the path that led to his theory. 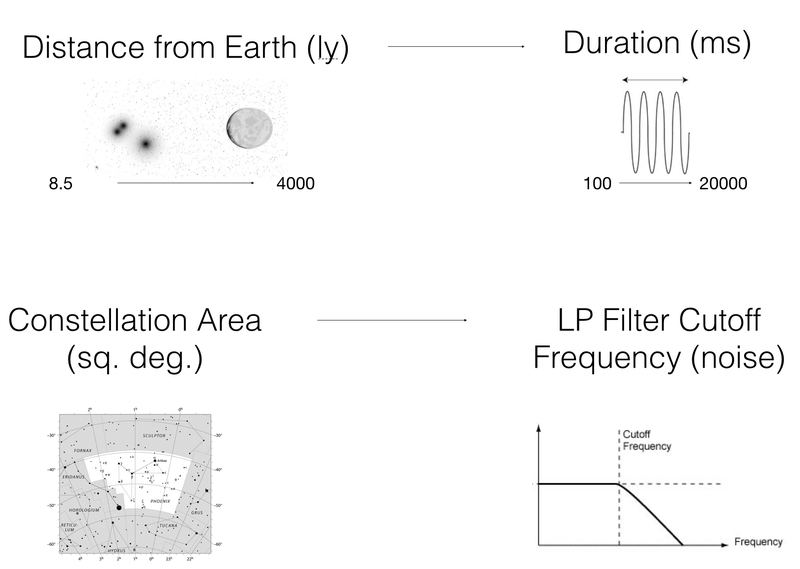 Granular synthesis derives from considering sound the same nature of light, binding well to the sonification process which acts in Stellar. I used a type of granular synthesis called prototype asynchronous. It uses as source material waveforms without preserving the timbre. The granulator parameters are: frequency, length of grains, grain density, number of harmonics and inharmonicity. In the granulator it is also implemented a distortion, a simple delay with feedback and an automated stereo pan-pot . I mapped the temperature of the stars to the frequency, the magnitude to the density of the grains and the distance from the Earth to to the length of the grains. 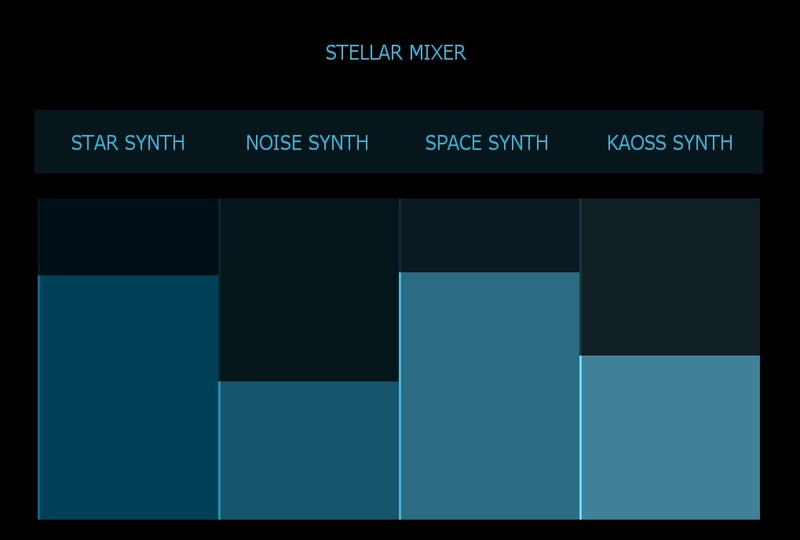 In Stellar 2.0 I have also introduced new sonification data. Using API made available by darksky.net site, I could get, with an internet connection, real-time information about the weather conditions of a specific place. The data I have taken into account are the outdoor temperature, the cloudiness, the wind speed and the amount of precipitation. The outdoor temperature controls the number of harmonics: the higher the temperature, the warmer the sounds. I thought as conceptually coherent to correlate the cloudiness with the stellar quality of observation, using it to control the sound distortion. Another potentially disturbing factor is the wind speed, which I mapped to the inharmonicity of the granulator. In this way with a calm situation, harmonic sounds will be produced, whereas with a worse scenario, the dissonant amount will gradually increase. Finally, the amount of precipitation, controls the frequency of the stereo pan pot. The concept for the third and final synthesis engine is the cosmic chaos. I used an additive synthesis synthesizer with a randomic system constantly changing the assignation of the mapping of the sonificated parameters. In addition to the sound synthesis I also wanted to develop a visual part with a patch written in Jitter. 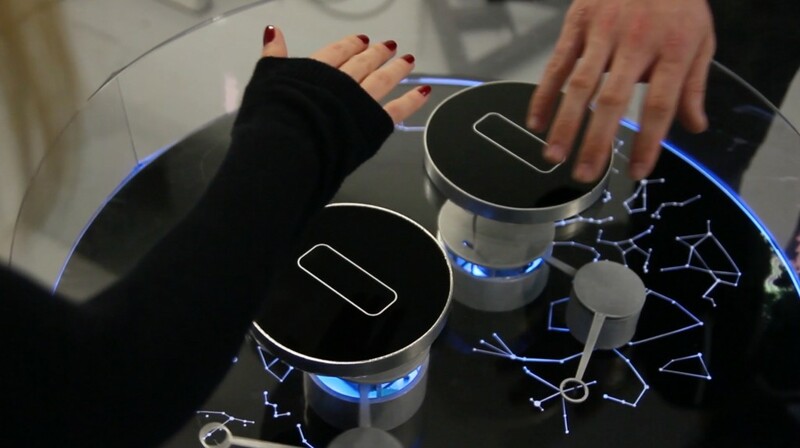 This made possible to create abstract patterns controlled by real-time sound contents and characterized from the actual colors of the triggered stars. To control all functions I designed a touch screen interface using the program “Lemur” for a iPad. The screen shows a mixer through which is possible to mix the sounds generated by the different synthesis engines. DE.MO./MOVIN’UP I Session 2015 project, and promoted by the Ministry of Cultural Heritage & Activities & Tourism, General Directorate for Contemporary Art, Architecture and Urban Suburbs and GAI – Association for the Circuit of the Young Italian Artists. The Creators Project, Arduino.com Homepage, s+v+m, InteractiveDesign.it, Popaganda, Adafruit,Atmel, Codeduino, Planet Arduino, dA.